WASHINGTON, DC, August 23, 2011 (ENS) – UPDATE: 60 more protesters were arrested in front of the White House Tuesday morning, including actors Margot Kidder and Tantoo Cardinal. 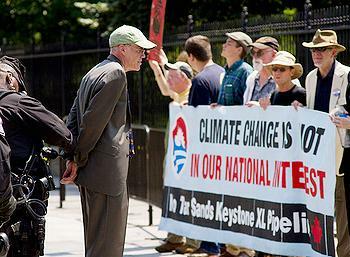 “Yes we can,” about 65 protesters chanted Monday morning as they began a third day of sit-ins in front of the White House, calling for President Barack Obama to reject a permit for the Keystone XL tar sands oil pipeline from Canada. Before noon, another 52 people were arrested by the U.S. Park Police, in addition to 65 protesters arrested Saturday and 45 people arrested on Sunday. They view this permit decision as a test of the President’s environmental principles and his will to “live up to the promises that so inspired us in his 2008 campaign,” in the words of protest organizer, environmentalist and author Bill McKibben, who was arrested at the White House on Saturday. But President Obama did not see the demonstrations as he is on Martha’s Vineyard with his family for their annual summer vacation. The protestors warn the pipeline would send hundreds of thousands of barrels a day of the world’s dirtiest oil to U.S. refineries and promote further development of the Alberta tar sands. Calgary-based TransCanada Keystone Pipeline proposes to construct and operate a pipeline to transport crude oil extracted from tar sands from an oil supply hub near Hardisty, Alberta, Canada to destinations in the south central United States, including a new tank farm in Cushing, Oklahoma and refineries near Port Arthur and Moore Junction, Texas. 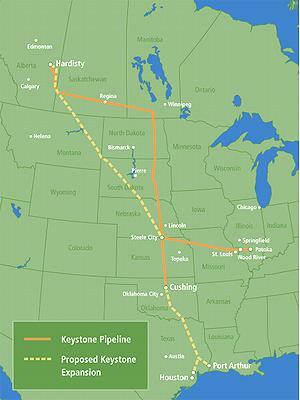 Because the proposed pipeline would cross the United States-Canada border, a Presidential Permit issued by the U.S. Department of State is required for the project to proceed. This makes the pipeline subject to the National Environmental Policy Act, which requires disclosure of potential environmental impacts and the consideration of possible alternatives. TransCanada’s proposed US$7 billion pipeline would cross the international border between Saskatchewan, Canada, and the United States near Morgan, Montana. Deposits of thick, tarry bitumin underlie about 140,000 square kilometers of northeastern Alberta, an area about the size of the state of Florida. Producing synthetic crude from tar sands requires natural gas to heat water for steam to separate the oil from the sand. 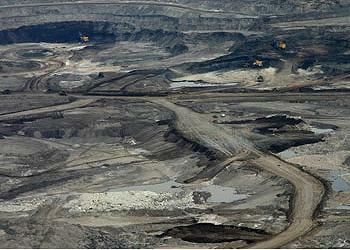 Tar sands operations currently use about .6 billion cubic feet of natural gas a day. By 2012, that level is expected to rise to two billion cubic feet a day, more than all the gas available from the Mackenzie Gas Project to the north. The process water is discharged into growing toxic tailings ponds already the size of the city of Vancouver. The whole process generates two to four times the amount of greenhouse gases per finished barrel of oil as the production of conventional crude oil. As extraction proceeds, about 500 square kilometers of the forest that once covered the tar sands would be destroyed by the mines, roads, pipelines and supporting facilities. In a 2008 report, the Natural Resources Defense Council, the Boreal Songbirds Initiative and the Pembina Institute estimated that this forest destruction will reduce songbird populations by 166 million birds over the next 30 to 50 years. McKibben said he expects that the 45 protestors who remain in jail from Saturday’s demonstration will be released Monday afternoon. 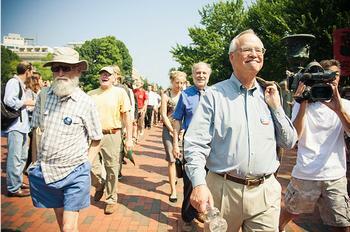 Among those arrested Saturday was Gus Speth, former dean of the School of Forestry and Environmental Studies at Yale University. Speth sent a statement from jail through his wife. Now a professor at Vermont Law School, from 1993 to 1999, Speth served as administrator of the United Nations Development Programme. He served as chairman of the White House Council on Environmental Quality in the Carter administration, and he is a co-founder of the Natural Resources Defense Council and founder of the World Resources Institute. 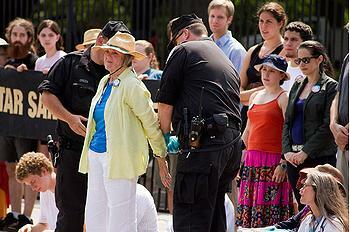 The sit-in at the White House will continue tomorrow morning with 50 more Americans and Canadians risking arrest. Over 2,000 people have registered to take part in the sit-in, which will continue every day until September 3. Among those planning on being arrested tomorrow are film-star Margot Kidder, who played Lois Lane in four Superman movies, and actress Tantoo Cardinal, a Cree actress who appeared in Dances with Wolves, Legends of the Fall and Smoke Signals. Cardinal, who was born in Ft. McMurray, Alberta, the capitol of the tar sands, was made made a Member of the Order of Canada in 2009. Two unions said Friday that they oppose the Keystone XL pipeline, a position that pits them against the International Brotherhood of Teamsters, one of the largest unions. The Transport Workers Union and the Amalgamated Transit Union told the “Washington Post” that the $7 billion pipeline could pollute groundwater and cause health problems near the Texas refineries. But the risks may have been underestimated. University of Nebraska-Lincoln engineering professor John Stansbury reported this year that TransCanada has underestimated both the frequency of spills on the pipeline and the severity of the worst-case scenario spills. NASA climatologist Dr. James Hansen said in a paper published this summer that tar sands development could mean “essentially game over” for the climate.